As I've been telling people about the flavors in the Humphry Slocombe Ice Cream Book , I keep hearing: "Wait, ice cream?" Yes, ice cream. This is the first book from the San Francisco ice cream shop, and I received a review copy. I first heard of Humphry Slocombe when I read Mission Street Food since their ice cream was served for dessert when MSF moved from the taco truck into the first restaurant. I knew they were known for unique flavors, and it was these recipes that sent me off in search of vadouvan curry and cubeb pepper. The curry powder is used in the Peanut Butter Curry ice cream, and the cubeb pepper is in Pepper and Mint Chip. Several of the flavors include a savory angle to accent the sweetness like Chocolate Smoked Salt, Strawberry Candied Jalapeno, and Candy Cap which is made with dried candy cap mushrooms. The thrill of this book is the surprising flavor combinations, but there are a few conventional options as well. There's a Tahitian V*nill@, Here's Your Damn Chocolate Ice Cream, Malted Milk Chocolate, and Blue Bottle Vietnamese Coffee. The shop's signature flavor is Secret Breakfast which combines bourbon and corn flakes in the form of chopped corn flake cookies. I can't wait to try that one. Since I couldn't decide which flavor to make first, I handed the book to Kurt and asked him to choose one. No surprise, he handed the book back opened to the Stout page. 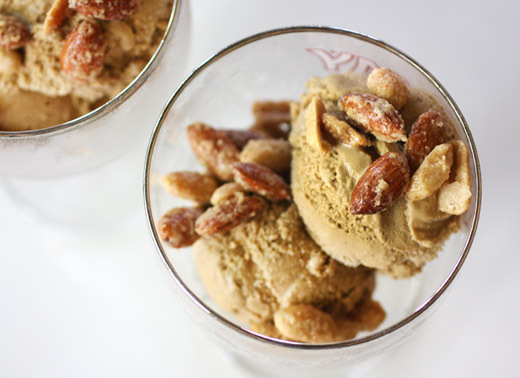 It's an ice cream made with reduced stout, brown sugar, and molasses, and there's a variation for turning it into Beer Nut Ice Cream by adding Frosted Peanuts. I congratulated Kurt on a great choice and put the ice cream canister in the freezer. In the recipe introduction, it's explained that they didn't expect this flavor to be as popular as it is. They write that the beer geeks keep asking for it and go on to describe the beer geeks as "the Trekkies of the food world." I loved relaying that quote to Kurt. It's also noted that this ice cream could be made with any beer, but stout becomes syrupy when reduced and works especially well. I chose a chocolate stout, but the chocolate flavor wasn't a part of the finished ice cream. After reducing with brown sugar, the stout tasted like butterscotch. Molasses and salt were added followed by milk and cream. When the mixture was back to barely a simmer, it was slowly poured into a bowl of egg yolks and sugar while whisking to temper the yolks. The custard-to-be was poured back into the saucepan and heated while stirring until thickened. It was poured through a strainer into a measuring pitcher set in an ice bath, allowed to cool, chilled in the refrigerator, and then churned in an ice cream maker. Meanwhile, I made the Frosted Peanuts. You just whisk together an egg white, some sugar, vanilla extract, and salt, and then add nuts. I used both peanuts and almonds, and coated them with the egg white mixture. Then, they were spread on a baking sheet and baked in a low oven for about half an hour. The nuts were stirred every 10 minutes while baking to prevent them from clumping. As the stout and brown sugar cooked and reduced, it smelled like delicious, malty butterscotch, and that's how the ice cream tasted too. The sweet-salty, crunchy nuts fit the flavor perfectly. For more beer ice cream, there's also a Guinness Gingerbread flavor in the book, and I'm already planning to serve that for dessert for Thanksgiving this year. And while I wait for fall, there are sorbets to try like Thai Chile Lime, Cayenne Cantaloupe, and Hibiscus Beet. For frozen desserts beyond the ordinary, this is the book for inspiration. Recipes reprinted with publisher's permission from Humphry Slocombe Ice Cream Book . No, you can’t get drunk from beer ice cream. Well, maybe you can if you eat a few gallons of it, but in that scenario, you’d throw up from the fat and dairy well before getting a buzz from the beer. 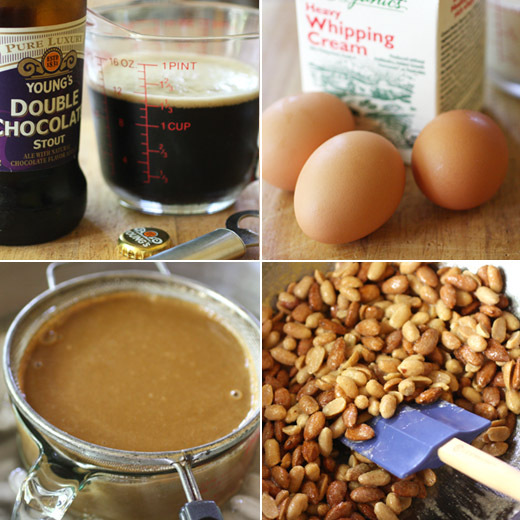 We mostly use stout in the shop—it gets rich and syrupy when reduced, permeating the air with a great yeasty smell—but you can use this basic recipe with any kind of beer. We like cheap beer, medium-priced wine, and expensive bourbon. Unfortunately, cheap, watery beer like PBR or Bud Light won’t work too well, because the lighter the beer, the less pronounced the flavor. We’ve come to favor any variation of stout, but if you’re a real beer fanboy, you can try other kinds of beers that have strong, distinct flavors. (For example, IPA gets its own flavor during Beer Week; we don’t offer it during the rest of the year, though, because the hops are very pronounced. It’s not for everyone, but beer geeks love it. We thought beer ice cream would be more or less a novelty that comes and goes, but the legions of beer geeks proved us wrong. They’re like the Trekkies of the food world, and their passion never ceases to amaze. Now beer is in our regular rotation. Lick your beer; we promise to hold your hair back if you have too much. In a large, heavy-bottomed, nonreactive saucepan over medium heat, combine the beer and brown sugar and cook, stirring often, until reduced by half, 15 to 20 minutes. It should be slightly sticky to the touch. Add the molasses (if using) and salt and stir to dissolve the salt. Add the cream and milk and cook, stirring occasionally, until hot but not boiling. Fill a large bowl or pan with ice and water. Place a large, clean bowl in the ice bath and fit the bowl with a fine-mesh strainer. Meanwhile, in a medium bowl, whisk together the egg yolks and sugar until well blended. Remove the cream mixture from the heat. Slowly pour about half of the hot cream mixture into the yolk mixture, whisking constantly. Transfer the yolk mixture back to the saucepan with the remaining cream mixture and return to medium heat. Cook, stirring constantly with a rubber spatula and being sure to scrape the bottom of the saucepan so it doesn’t scorch, until the liquid begins to steam and you can feel the spatula scrape against the bottom of the pan, 2 to 3 minutes. Remove the custard from the heat and immediately pour it through the strainer into the clean bowl you set up in the ice bath. Let cool, stirring occasionally. When the custard has totally cooled, cover the bowl tightly and chill in the refrigerator for at least 1 hour or preferably overnight. When you are ready to freeze the custard, transfer it to an ice cream maker and spin according to the manufacturer’s instructions. Eat immediately or freeze for up to 1 week. Fun Fact: Before the New York Times profile on Humphry Slocombe was published, we had to submit to a bunch of fact-checking. Jake spent hours on the phone with the marvelous Anaheed Alani. Somewhere along the way, she mentioned that her favorite ice cream was a beer-and-peanut flavor from a Manhattan shop. To thank her for her work, Jake sent a pint of the ice cream that would later become, in tribute, Anaheed’s Beer Nut. We hope it’s her new favorite. To make it for yourself, prepare Stout as directed and stir in ½ cup Frosted Peanuts after spinning the custard in your ice cream maker. Free Advice: Since the beer ice creams are all so high in alcohol (compared to other ice creams that is), they probably won’t freeze completely in your ice cream machine—depending on what kind of machine you have, of course. Don’t fret; freeze as best as you can in the machine and finish it off in the freezer. Transfer to an airtight container, cover, and freeze until it reaches the desired consistency. We use Frosted Peanuts in our Tin Roof sundae and in our Beer Nut ice cream, but there are about 391 other uses for them, including just snacking on them. Preheat the oven to 250°F. In a medium bowl, lightly whisk together the sugar, egg white, vanilla, and salt. When everything is smooth and mixed, stir in the peanuts. Spread out the coated peanuts on a Silpat or parchment lined baking sheet. Bake, stirring every 10 minutes so the nuts separate and do not stick together in one big clump, until the nuts are dry, about 30 minutes. Transfer immediately to a plate to cool. Keep for up to 2 weeks in an airtight container. Wow, that's definitely an ice cream for me! What a goregous combination. Very tempting ice cream. I am starting to make a lot of ice cream lately. Oh my gosh...so many types of ice cream! Now I feel like lagging behind. Need to catch up. I don't think I can find all those flavours here. 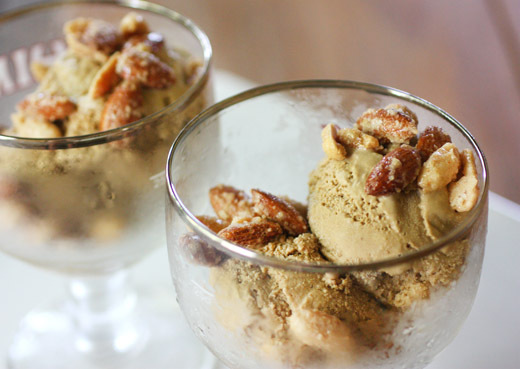 Love your beer ice cream with almonds. Just looks too good....drooling :D I need 2 big scoops! What unique ice cream recipes! This looks outrageously good! The cherry walnut I just made looks mighty boring right now! I'd rather have this. Sounds like some unique ice creams, the beer nut ice cream looks amazing! My sister is a regular at HS! I love beer ice cream. Like the addition of nuts to balance it out. Bookmarked! My dad will love it! Thank you! Yes, you may use a photo and link back to the post. Lisa, what a wondrous concoction! I bet this was such a hearty and flavorful dessert. A very creative and clever use of chocolate stout for cooking purposes! I just may have to order another ice cream cookbook! What a fantastic melding of flavors. An amazing ice cream that transcends the summer season. I imagine this ice cream would also be wonderful in the fall. Thank you for the cookbook introduction, Amazon loves me! i need this cookbook! this sounds AMAZING! i'm dying to try this flavor! What a fun idea for ice cream! And I love the beer nut garnish! Wonder if the beer lovin' hubby will go for this? The name makes me giggle! What a fabulous way of reinventing ice cream! I love how the flavours are a bit leftfield while still looking very appealing. Very moreish indeed. I didn't realise Youngs (A London brewery) exports its Stout to the US! Loved the listing of interesting ice cream varieties. I had no idea that ice creams could be so varied and wonder how fun it would be to constantly play around with ingredients until you get that "wow" combination that gets included in the cookbook lineup. My husband would definitely be intrigued by this as well! I've never tried any flavour out of the ordinary yet but it sounds very interesting. im generally not a fan of beer-flavored anything, but frosted peanuts? yes please! What an unique and interesting ice cream recipe! I might just try it with malt beer. I can't believe we've never stopped in Humphrey Slocumb on our trips to SFC. I've heard so much about their ice cream, I should really pick up the book. This looks like one Eric would love as well. Beer and ice cream? Can't go wrong. Tell Kurt good choice! this recipe is a keeper..
i can imagine it being a complete hit on boys game night!! You do know Ice Cream Month is right around the corner right? Well, I might be searching for this book because some of those combinations you mention surely are worth a peek. Do drop by for the picnic on Sunday at my blog, it's going to be fabulous!!! I've been to Humphrey Slocombe and it really is as good as you'd imagine it to be. Maybe even better. I've been dying for their cookbook and you've made me want it even more! Oh wow, speechless! This is amazing! It's definitely going in our ice cream maker soon! What an interesting ice-cream! Would love to try some. I bet the beer gives a dark and deep flavor similar to molasses/ love the nuts as a texture play with it.